Often it takes an outsider's perspective to breathe new life into something ordinary, as evidenced by Ponyboy breathing new life into Cherry, via his introspective sincerity/wang. For an outsider cooking up Asian grub you ain't never had, hit Morph. Sprucing up boring old Asian food is clearly a job for... the architect/first-time chef who created Morph, a pan-Asian fusion joint whose space-agey design elements are just as painstakingly considered as the unexpected grub combos it plates up, which you know you can trust, since the architect actually is Asian. 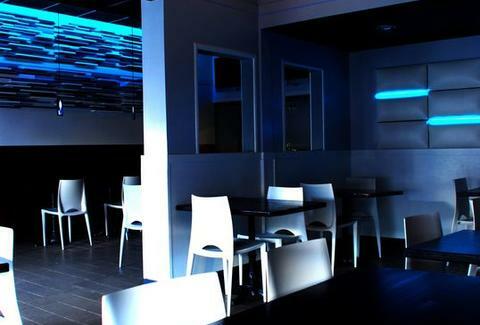 Tables're flanked both by dark wooden bench seating and white avant guard chairs that appear to be from the future, and're lit not by light bulbs, but glowing x-ray images of light bulbs, while adorning the walls (which constantly change color, naturally) are hand-cut/interlocking slats of wood, embedded neon blue light tubes, and some pleather, loony bin-style padding for those who're just crazy about interior design and apparently, everything else. The menu's scope'll change constantly, but initially will consist of Japanese/Thai marriages like green curry with cold soba noodles, tamarind sauce-flanked soy paper cones of BBQ pork, and cilantro/lime/garlic sauce-aided oyster shooters that're served with fried onions in a steaming bowl of dry ice, so you can freeze off warts while you dine which is cool. Washing it all down's a small bevy of Asian beers (Kirin, Singha, etc), plus around ten bottles of wine from all over that've been handpicked by the architect's juice-loving wife -- stay gold, juice-loving wife. Stay gold.